The Defenses and Special Teams Breakdown offers data-driven analysis for each week’s main NFL slate. For more of our weekly football content, visit our NFL homepage. The Ravens are only $2,800 on DraftKings and lead the way in our Ceiling Projections to go with their slate-best 3.4 projected sack total. It’s an intriguing spot against Baker Mayfield. Rookies can be prone to mistakes, and Mayfield showed that this past Sunday, getting sacked twice and throwing two interceptions against a Raiders defense that struggles to generate pressure. Now Mayfield will take on a Ravens defense that grades as Pro Football Focus’ No. 7 pass-rushing unit. The Ravens are one of the best values on DraftKings with a +1.24 Projected Plus/Minus. Fellow rookie Josh Allen could be in for a long day as the Bills offensive line ranks 32nd in Football Outsiders’ adjusted sack rate against a Titans defensive line ranks 10th in adjusted sack rate. The Titans have done a tremendous job of getting to the quarterback, generating 36 quarterback hits — per Sports Info Solutions — through four games, which is the sixth-highest mark in the league. The Titans are projected to be lower-owned on DraftKings, giving them an exceptional 80% Leverage Rating. Arizona Cardinals ($2,900 DraftKings; $4,300 FanDuel): The 49ers are graded as PFF’s worst pass-blocking unit, creating a mismatch in the trenches against a Cardinals defense that has generated 51 quarterback hurries (seventh-most in the NFL) while ranking sixth in adjusted sack rate. The Cardinals could go low-owned given that they’re 4.5-point underdogs on the road, but they’re an interesting tournament play with the third-highest sack projection in our models. Carolina Panthers ($3,300 DraftKings; $4,400 FanDuel): There’s a perfect storm of factors for the Panthers against the Giants in Week 5. For starters, the Panthers are 7-point home favorites. Historically, defenses with comparable spreads have averaged a +1.07 DraftKings Plus/Minus with a 50.6% Consistency Rating (per our Trends tool). And second, the Giants offensive line ranks only 26th in adjusted sack rate, and the offense is implied for a mediocre 18.75 points. San Francisco 49ers ($3,000 DraftKings; $3,800 FanDuel): On DraftKings, the 49ers lead the main slate with an 86% Leverage Rating since they’re projected for only 2% to 4% ownership, but boast the third-highest Ceiling Projection. They’re home favorites against a Cardinals team that’s implied for just 18.25 points. Historically, defenses against offenses with comparable implied totals have averaged a +1.44 DraftKings Plus/Minus with an excellent 54.7% Consistency Rating. Cincinnati Bengals ($2,700 DraftKings; $3,900 FanDuel): Per PFF, Ryan Tannehill has been pressured on only 24.3% of his dropbacks, but the Bengals have done an amazing job of getting to the quarterback. They’re tied for a league-high 41 quarterback hits and quarterback knockdowns (19), per SIS. The Bengals presently own the fourth-highest Ceiling Projection in our models. 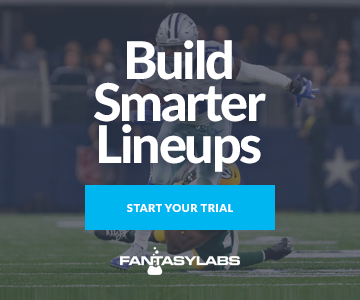 Denver Broncos ($3,200 DraftKings; $4,100 FanDuel): Sam Darnold has been pressured 53 times this season, the seventh-highest mark in the league, and he’s set to take on a Broncos defense that ranks inside the top 10 in hurries (46), hits (38) and pressures (52). Moreover, Darnold has taken 10 sacks and has thrown two interceptions when under pressure this season. NFL Week 1 Fantasy WR Breakdown: Should You Fade Antonio Brown in Bad Weather? NFL Week 3 Fantasy RB Breakdown: Will Kareem Hunt Finally Break Out vs. 49ers? NFL Week 4 Fantasy TE Breakdown: Should You Fade Zach Ertz vs. Titans? Raybon: Should You Bench Patrick Mahomes in Fantasy vs. Jags D?